The goddess Demeter was celebrated throughout Greece. She personifies the devoted mother and is especially sacred to mothers and daughters. Demeter's Appearance: Usually a pleasant-looking mature woman, generally with a veil over her head though her face is visible. Often carrying wheat or her Horn. A few images of Demeter show her as very beautiful. She may be shown seated in a throne, or wandering in search of Persephone. Demeter's Symbols and Attributes: An ear of wheat and the Horn of Plenty (Cornucopia). 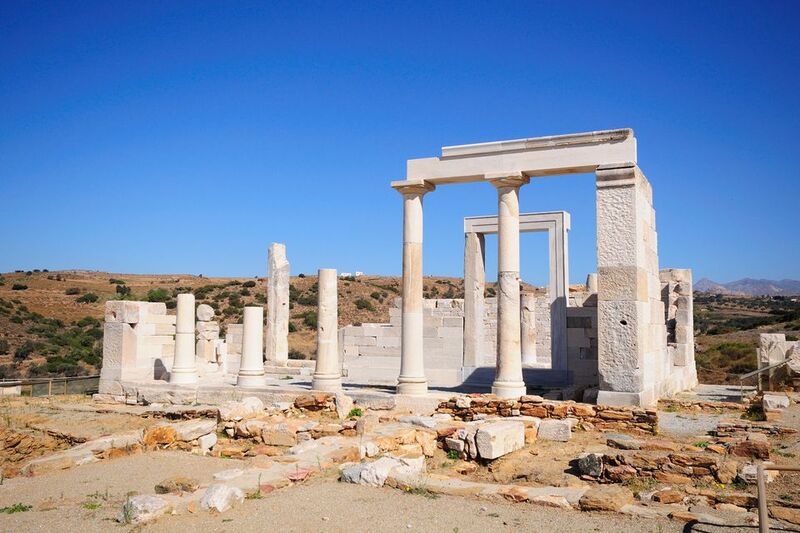 Major Temple Site to Visit: Demeter was revered at Eleusis, where initiatory rites called the Eleusinian Mysteries were performed for select participants. These were secret; apparently, no one ever broke their vows and described the details and so the exact content of the rites is still debated even today. Eleusis is near Athens and can still be visited though it is regrettably surrounded by heavy industry. Demeter's Strengths: Demeter controls the fertility of the earth as goddess of Agriculture; also gives life after death to those who learn her Mysteries. Demeter's Weaknesses: Not one to cross lightly. After the kidnapping of her daughter Persephone, Demeter blights the earth and won't let the plants grow. But who can blame her? Zeus gave Hades permission to "marry" Persephone but whoops! didn't mention it to her or her Mom. Demeter's Spouse: Not married; had affair with Iason. Demeter's Children: Persephone, also known as Kore, the Maiden. Zeus is generally said to be her father, but at other times, it seems as if Demeter managed without anyone else involved. Demeter's Basic Story: Persephone is snatched by Hades; Demeter searches for her but can't find her, and finally stops all life from growing on the earth. Pan spots Demeter in the wilderness and reports her position to Zeus, who then starts negotiations. Ultimately, Demeter gets her daughter for a third of the year, Hades gets her for a third, and Zeus and the other Olympians have her services as a handmaiden the rest of the time. Sometimes this is a simpler split, with Mom getting six months and Hubby getting the other six. Interesting Demeter Facts: Some scholars believe that the mystery rites of Demeter derived from those of the Egyptian goddess Isis. In Graeco-Roman times, they were sometimes considered to be the same or at least strongly similar goddesses. Ancient Greeks might also dedicate sneezes to Demeter, similar to someone saying "God bless you!" An unexpected or timely sneeze could be thought to have oracular meaning as a message from Demeter, perhaps to abandon the idea under discussion. This may be the origin of the phrase "not to be sneezed at", not to be discounted or taken lightly. The 12 Olympians - Gods and Goddesses - Greek Gods and Goddesses - Temple Sites - The Titans - Aphrodite - Apollo - Ares - Artemis - Atalanta - Athena - Centaurs - Cyclopes - Demeter- Dionysos - Eros - Gaia - Hades - Helios - Hephaestus - Hera - Hercules - Hermes - Kronos - Medusa - Nike - Pan- Pandora - Pegasus - Persephone - Poseidon - Rhea - Selene - Zeus. Flights To and Around Greece: Athens and Other Greece Flights at Travelocity - The airport code for Athens International Airport is ATH.